I recently got a Rat Cutlery RC4 and am very happy with it. It is sized just right for camping, hiking, and fits nicely on your belt, on your thigh, or in your pack. To start, the knife is made from 1095 steel. For those unfamiliar, 1095 steel is an exceptional hard use blade steel. You can really beat it hard and it will perform. One caution is that without a little care, 1095 steel will develop some rust, so you need to keep this knife oiled. You'll start to notice rust on the cutting edge and on the laser engraving first. The 1095 steel is pretty easy to sharpen, and holds a great edge. The blade is 3/16 thick, and full flat ground. I find the blade to be the perfect thickness for batoning and general cutting tasks. This knife will have no trouble cutting anything from game to tree branches...doesn't have any problems cutting food either. On the blade spine, there is some nice jimping. Not too sharp, but very usable. I'd say just about perfect. On the bottom of the blade, there is a nice slot for your index finger. At first I thought this was a little too small, but then I found a comfortable way to hold the knife where my finger fits perfectly. 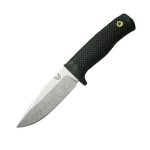 The scales on the RC4 are micarta, which is a great, durable material. 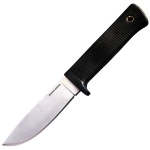 The micarta has a nice weave-like texture, and grips quite well, wet or dry. On the bottom of the handles, there's a lanywad hole, and you could use the end to break glass if you had to, although it is a little too rounded to be ideal. My only complaint with the RC4 is that I wish the handle on this knife was a half inch longer. I like the handle to be slightly larger than the blade I carry in knives this size. The sheath is kydex, and the knife snaps in tight. You can get the RC4 with the Molle back and clips, which is what I did. These serve their purpose as expected, and don't have any noticable shortcomings. Overall, the RAT Cutlery RC4 is a really superb knife though. It is incredibly tough, and has handled everything I've thrown at it. I don't expect to take RAT up on their warranty ever...I think this knife will outlast me. Also, I should mention that RAT Cutlery has by far the best warranty I've heard of from any knife manufacturer. If you break it, whether it be by abusing it or during normal use, they will replace it, no questions asked.